The Priory Church of St Mary, more commonly known as Lancaster Priory, is one of the finest medieval churches in England. The Grade I listed building stands on a hill next to Lancaster Castle and overlooks the River Lune. The site was once occupied by a Roman fort, but only traces of this remain today. It is thought that a church was first established on the site in Anglo-Saxon period. It was first referred to in a written document of 1094 and elements of the church, such as a doorway in the west wall, appear to be of Saxon origin. The majority of the church as it stands today was built in the fifteenth century. In 1743 the church purchased new bells so the ringing could be heard further afield. To further the goal the tower was also elevated by thirty feet. Unfortunately, the tower couldn’t bear the weight of the additional bells and stone and was in danger of falling down. In 1753 a decision was made to demolish the tower. It was replaced with the one that stands today. The Regimental Chapel is a more recent addition. It was built in 1903 in memory of the members of the King’s Own (Royal Lancaster Regiment) that lost their lives during the Second Boer War (1899 to 1902). 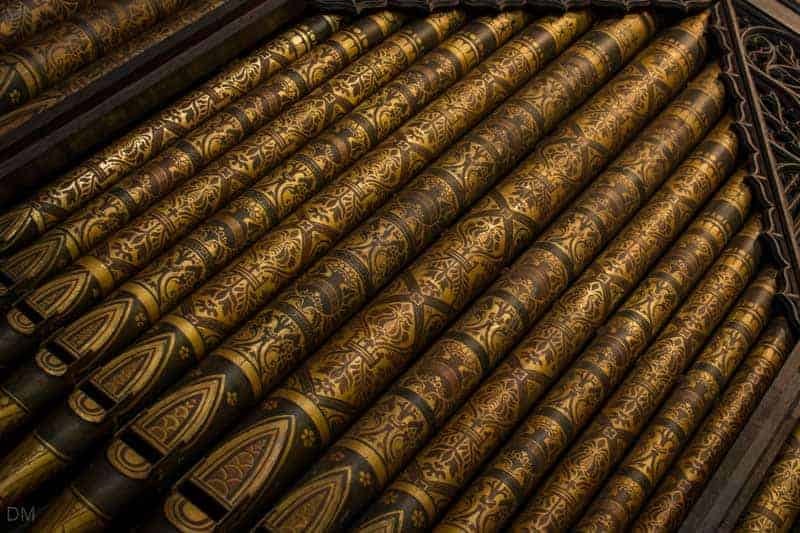 One of the most important features of the church are its beautiful choir stalls. They date from around 1345 and are the third oldest in England. Standing on both sides of the chancel, they are carved from oak and feature hand-embroidered tapestries. The hinged seats of the choir stalls have misericords; small wooden shelves to lean on while standing. The misericords are decorated with ornate carvings; many of which were vandalised by Oliver Cromwell’s troops during the English Civil War. 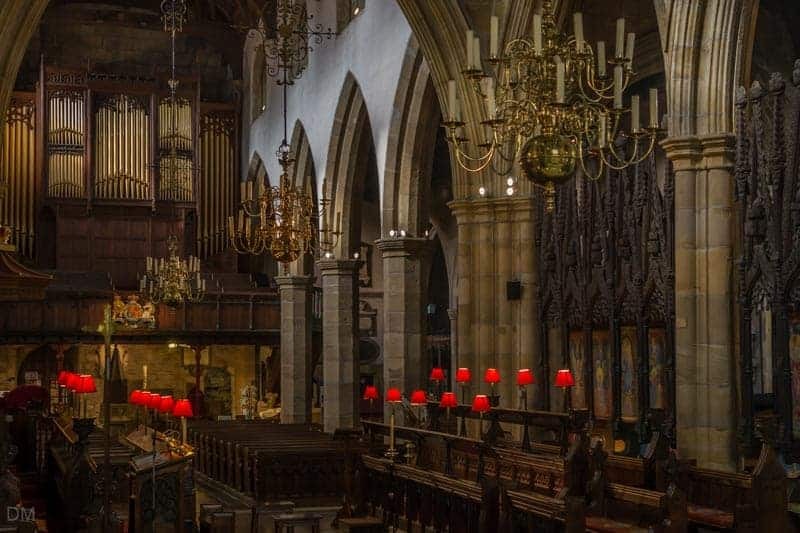 Considered priceless, the choir stalls were temporarily removed during World War II to minimise the risk of bomb damage. 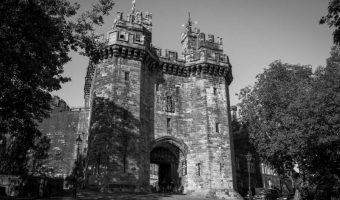 They were stored in the dungeons of Lancaster Castle. The pulpit was restored for the 1999 visit of Elizabeth II, Queen of the United Kingdom and the Duke of Lancaster. The canopy is topped with the original seventeenth century crown, found in the tower by James Glenn; Head Verger from 1966 to 1993. Lancaster Priory has two pipe organs. Both were installed in 2012. The one above the gallery was built in 1915 by Henry Willis was rescued from St John’s Church in Blackpool. The organ in the chancel was built in 1906 by Harrison and Harrison. It was originally located in Blackburn Girls’ High School. Both are played from the same console so are really separate parts of the same instrument. An interactive display gives visitors the opportunity to learn more about the history of organs at Lancaster Priory. Three sixteenth century brass chandeliers hang from the ceiling; attached by ornamental iron rods. 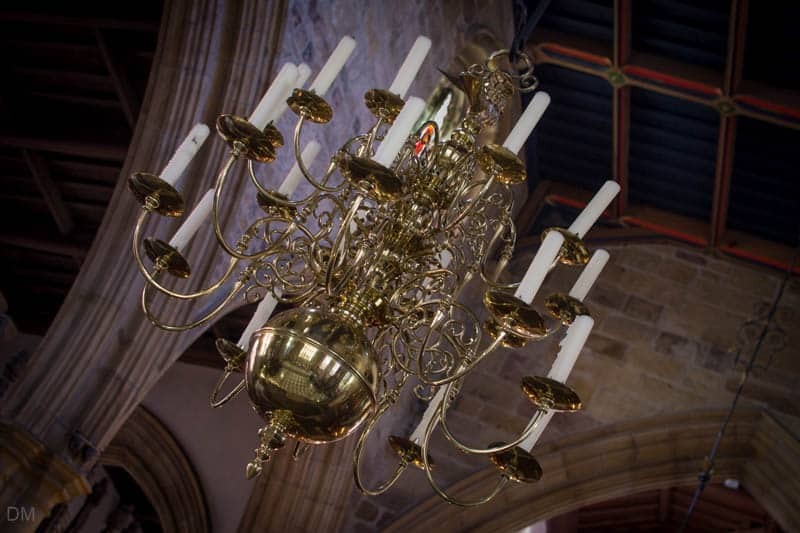 They were given to Lancaster Priory in 1717 by William Heysham, MP for Lancaster, and are lit for special occasions. Lancaster Priory hosts events throughout the year. They include classical music concerts, choral performances, carol services, organ recitals, and more. 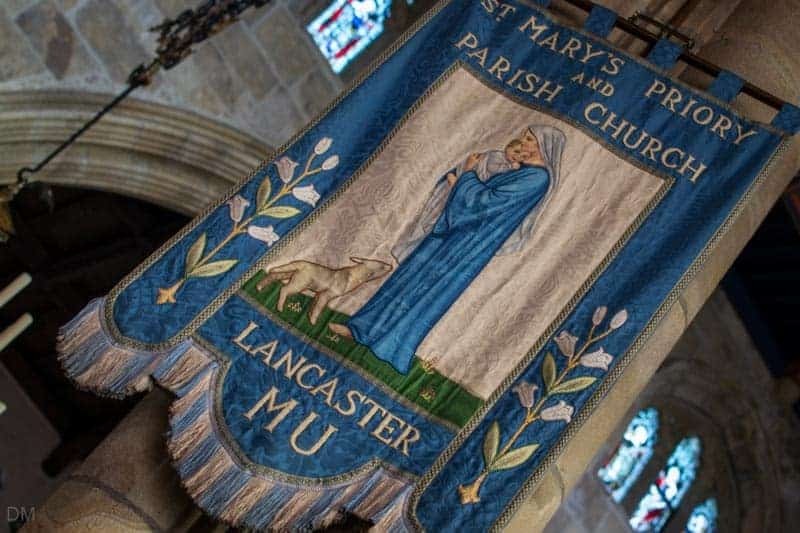 Visit the official Lancaster Priory website for a full schedule of events. 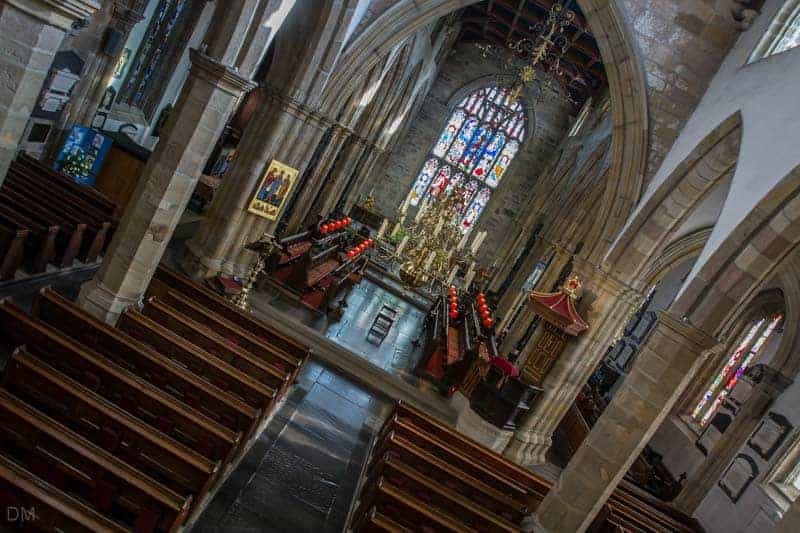 Visitors are welcome to visit Lancaster Priory and explore at their own pace. Entry is free but donations towards running costs are appreciated. It is open to visitors throughout the year, Monday to Saturday. At the time of writing (October 2015) services are held on Sundays (8 am, 10 am, and 6.30 pm), Tuesdays (10.15 am), and Wednesdays (12.30 pm). 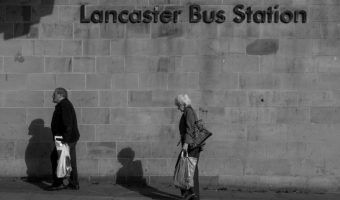 Lancaster Priory is situated on Priory Close at the north-western corner of Lancaster city centre, immediately north of Lancaster Castle. 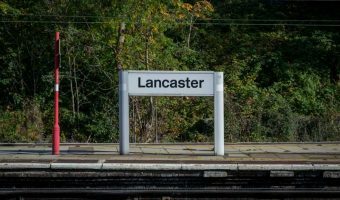 Lancaster Train Station and Lancaster Bus Station are within easy walking distance. The Cottage Museum and Judges’ Lodgings are also nearby. Parking on the grounds of Lancaster Priory is reserved for staff. Short-term pay-and-display street parking is available on Castle Hill and St Mary’s Parade to the south of the church. Longer term parking options are offered by the Parksafe car park on Damside Street and the Lancaster City Council car park on Dallas Road. Map showing location of Lancaster Priory.